Two people were seriously injured in a crash Tuesday morning near Seattle’s Portage Bay neighborhood, police said. The incident occurred in the 2700 block of Harvard Avenue East. While the circumstances of the crash are still under investigation, some details are known. Two people were found trapped inside a vehicle. Both were freed from the vehicle, then taken to Seattle’s Harborview Medical Center in stable condition with serious injuries. A driver may breach a duty to use reasonable care while driving in a variety of ways, such as by texting while driving, talking on the phone, driving while tired, driving drinking and driving, or tuning the radio. Attorney Chris Davis of the Seattle-based Davis Law Group, P.S., is an experienced car accident attorney who has represented victims in Washington State for more than 20 years. 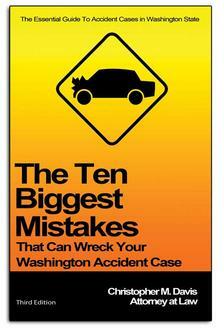 He exclusively handles lawsuits arising out of motor vehicle collisions. If you have been hurt in an accident with a truck, car, motorcycle, or bicycle, you may be facing substantial medical expenses and need to take time off work. You can protect your rights by enlisting Mr. Davis and his top-notch legal team. Davis Law Group has a strong reputation for furthering the interests of victims in settlement negotiations and at trial, where they can tenaciously pursue the full amount of compensation that you need from all available sources. Contact Davis Law Group today. Call (206) 727-4000, use the chat feature below or fill out the contact form on this page to get started.